Arnold Palmers only golf course design in Thailand and a good one. 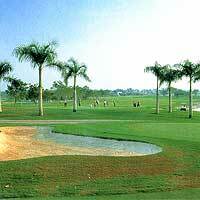 The course is located near the sea-side and provides a nice breeze to keep you cool even during the hottest months. It's a little rough around the edges, but the course is rumored to have a new General Manager that will hopefully make the necessary improvements. There are fewer water hazards than at most Bangkok courses, but the course is still challenging without being too difficult for the majority of players. Uniquely Thai with good value for money, although a recent price increase has made it less attractive. If the management and owners spent some money on this course, it could become one of Bangkok's hidden gems.